Please note that any event cancellations after the RSVP date will not be refunded. As one of the most active committees responsible for planning EMERGE Lakeland's flagship events, the Events Committee loves fresh ideas and new people! From professional development and leadership to our signature event the Emerge Annual Gala, the Events Committee always needs help planning and coordinating the breakfast, lunch and evening events that create value for all EMERGE Lakeland members within the community. Events Committee meets the third Thursday of the month at 12 p.m. in the back room at Mitchell's Coffee House (235 N. Kentucky Ave. Lakeland, 33801). Visit: http://business.lakelandchamber.com/events/calendar to register or for more information on locations and exact times. Interested in helping to spread the word about EMERGE Lakeland? Want to learn new marketing skills? The Marketing Committee would love to have your help with social media, email strategy, public relations, writing, graphic design, or general marketing support. You do not have to be creative to sit on this committee, we will gladly teach you the necessary skills! If you have any suggestions for useful content or ways the Marketing Committee can better promote EMERGE Lakeland, please email us. Marketing Committee meets the second Wednesday of the month, 8:00 a.m. at Black & Brew Coffee House (205 E. Main St. Lakeland, 33801). Have you ever found yourself saying, “if only I knew then what I know now”? Well, if you’re a human, especially a young professional, then there’s a good chance you fall in this category. 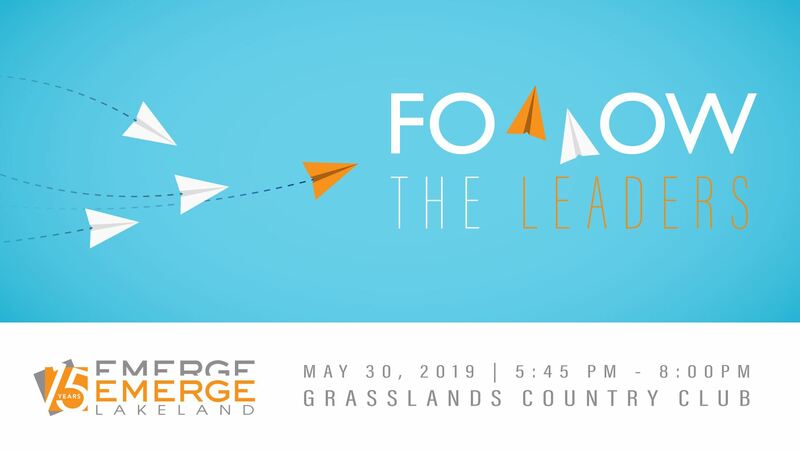 On Thursday, May 30th, we are hosting our amazing EMERGE 15 Year Anniversary Follow the Leaders event where you will have the chance to learn from our very own leaders who are EMERGE alumni. Learn how they have become success stories and how our group played a huge part in their growth. Good news: Ticket Prices are only $45/$55 (Member/Non-Member) and a nice sit down dinner is included with the elegance of the Grasslands Golf and Country Club. Bad news: Space is VERY limited, so there are only 45 tickets available. You’re not going to want to miss this one, so get your ticket while they last and mark your calendars! We hope to see there! Is there a better way to come together in the community than over food? Lend a hand and volunteer with EMERGE members to deliver food to the elderly in our community. When you RSVP, please indicate if you will be delivering boxes as an individual or with a partner. Please indicate how many boxes you plan to deliver (Max: 5). Please also indicate top two zip codes preferences. Boxes will be picked up on Thursday, June 6th during lunch. You have until the end of June to deliver the boxes at your own convenience. We will meet in the multipurpose room. VISTE has an additional parking lot on the corner of Magnolia Street and N. Lake Parker Avenue. RSVP Deadline is May 17th! The Polk Emerging Leaders Awards is an annual collaborative event hosted by Polk County’s three young professional groups. Continuing a new era of cooperation and blurring the perceived east/west dividing line, the awards recognize five young professionals between the ages of 21 and 42 making significant contributions to our community and who will continue to shape the direction of Polk County in the future. To nominate an individual for the Polk Emerging Leader Awards, simply fill out the form below. If you prefer to fill out and scan your nomination form you can download it here. Email the nomination to PELANomination@gmail.com. The nominee will be notified of the nomination and asked to complete an application to provide more information. The nominee will be emailed the application. PELA Nomination 2019.pdf Nominations are due May 29. Applications must be returned to pelanomination@gmail.com or dropped off at 401 Ave B NW, Winter Haven by NOON June 12, 2019. The annual PELA event offers an excellent opportunity to network with some of Polk County's most outstanding young professionals and prominent business leaders. The annual event recognizes five young professionals between the ages of 21 and 42 who have made significant contributions and commitment to the Polk County community. Congrats to last year's nominees! Join fellow EMERGE members August 29, 2019. Enjoy a cocktail hour and delicious sit down dinner as you are inspired by young professionals serving and giving back in our community. 02/28/2019 EMERGE Loves Lakeland - 15 Years Strong! 02/22/2019 Emerge v. Endeavor at Lakeland Magic Game! 01/24/2019 Swole before the Swine! 10/09/2017 Pack the Bar with EMERGE! 07/27/2017 Pack the Bar with EMERGE!